I still enjoy reading about all your exploits and reading the newsletter and seeing what you are all up to. Hope you are now both well. I was sorry to hear about the passing away of Bob, I was in contact with him back end of last year about oil pressure problems I was having — I couldn`t find the oil switch — thankfully a new one cured the problem. Haven`t been out much with the Caddy yet this year - the weather here has only just started to get better. Have got the electronic ignition kit and electric pump / switch modification but Jamie has been really busy doing his house up over winter and hasn`t been able to do the mods yet. However he took the carb of last month to overhaul it and found one of the floats was full of petrol and the other looked a bit ropey as it had been crudely re-soldered so a new pair was ordered and duly arrived at the weekend after being dispatched 3 weeks ago — our Postal Service is rubbish — awaiting customs clearance according to the tracker. Unfortunately I have missed a couple of Shows but hopefully will be back on the road soon. I couldn`t understand why the float had been repaired so I called to see our old mechanic who used to work for us when my Dad first bought the car. I was doubting the car was as original as I thought it was. Our old mechanic actually first found the car at a farm he used to go to.It was in a barn covered in chicken muck and 2 bushes had to be pulled out of the way by a tractor. It had been stood several years — we bought it in 1967 — but had only done 26,000 miles — between `54 and `67 — 71,000 now . Apparently it was bad starting when it was hot and my Dad said to him there would be a hole in the carb float, so it was duly soldered up — so 49 years later — same fault. Jamie said he doesn`t know how it ran as there was that much crap in the carb — so I guess it hasn`t been touched since. Have sourced 2 new hydraulic rams and motor for the convertible top as it hasn`t worked for the last couple of years - bent rams -from a company in Florida that I will pick up whilst there thus saving postage and our exorbitant customs duty. They are only about 80 miles from where we are, but we won`t get the address for the villa we are renting till we get to Sanford so I probably can`t get them sent there as I want to pay for them before we leave here. Guess with a welcome note like that to come on the Driving Tour we will do our utmost to be there . We toured Virginia a few years ago - drove the Skyline Drive from from Front Royal to Roanoake and then across to Virginia Beach and on to Washington. Going under the Chesapeake Bay Bridge / Tunnel was awesome Done Chattanooga, Nashville and Memphis as well. "His (my Grandfather - Leigh ) motor car experiences proved very eventful at times too, he bought an old Essex Super Six Coupe. Oh! that was the real American dream to us - wood wheels, pea green and cream. We felt like Norma Talmadge and Family (very wealthy and famous Hollywood silent screen star ) when we hit the road with it. However Dad didn't` like the petrol consumption - the engine was too big and petrol had soared to 1/2p, so a smaller engine had to be fitted, so from 6 cylinder to 4 cylinder -20 hp to 12 hp - a Bull Nosed Morris engine was fitted - along with the gearbox. Oh yes, it was alright, apart from there was room for another passenger under the bonnet, the starting handle was 3 feet long and at 30 mph the engine was revving its guts out. Still it did take us to Blackpool and back using more oil than petrol. Myself and sisters in the Dickey (Rumble - Leigh ) seat - no chance of seeing who was behind for the dense smoke out of the exhaust pipe"" This would have been in the 1930`s. I remember playing in that Essex when I was very young when it was abandoned in the yard . I still have the chassis plate — screwed on a cupboard door in my garage . It was a Model H — one of my earliest memories." My Dad`s road car in the `50`s was an Auburn ( photo included ) until getting the 1950 Cadillac Fleetwood and then the Eldorado - all 3 used for trailering his Antique Gladiator ( KKKKatie). I think there was a picture in the newsletter of a similar Auburn in a museum you visited a while ago My Dad wrote loads about his early life - his Father was on the Music Halls and also managed and owned cinemas and a Dance Hall. My dad later taking over these and the garage and also wrote about his early life in the wartime RAF. This newsletter come courtesy of Ron Melville (editor). Ron is the recipient of the Yann Saunders International Activity Award – 2013 and the Maurice Hendry Award – 2015 and International Newsletter Excellence Award – 2015; Winner 2011, 2012 & 2014 - Regional Sub-compact Club Magazine Category - Old Cars Golden Quill Awards. 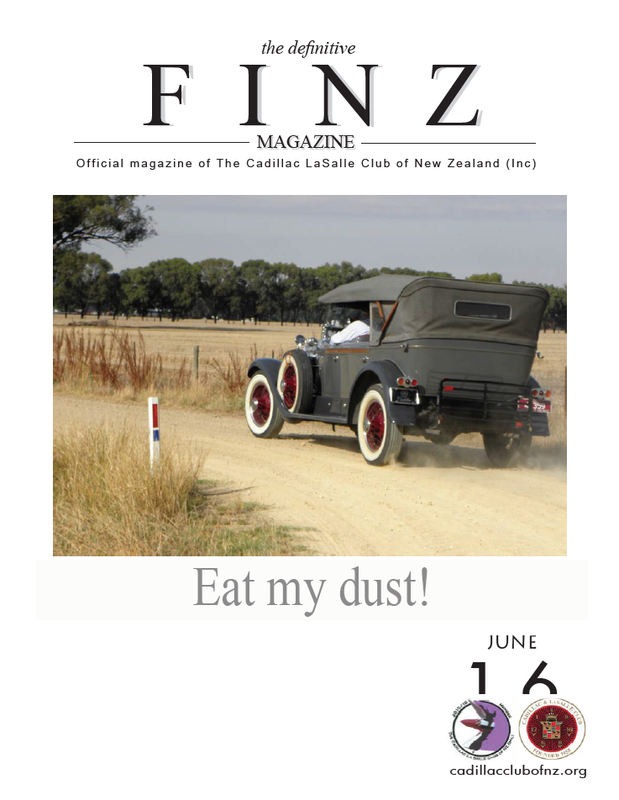 Hi everyone and welcome to the June 2016 issue of FINZ! • FINZ wins ‘International Newsletter Excellence Award 2015’ at the Las Vegas Grand Nationals and I was there! • And a terrific cover pic and ‘Tail-lights’ back cover shot as well! Please contact info@peachstateCLC.org for more information.